Designed to prevent future damage, protect healthy skin, and correct previous damage. SkinCeuticals is committed to advanced skincare products that are backed by science. This product is a mature skin remedy to diminish dark circles, puffiness, and effects of glycation. The signs of intrinsic aging, caused by internal factors such as hormonal shifts and metabolic slowdown, are most evident in the delicate eye area. A.G.E. 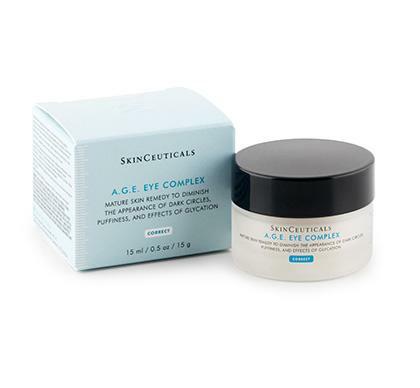 Eye Complex is a three-dimensional treatment that contains a unique combination of ingredients to dramatically improve dark circles, wrinkles, and puffiness caused by intrinsic aging. Proxylane™ reduces wrinkles and crow's feet. Blueberry extract helps prevent future wrinkles and crow's feet. A complex of flavonoids and synergistic peptides reduces the appearance of dark circles and diminishes puffiness and under-eye bags. Optical diffusers improve radiance in tired, dull eyes. This product is a mature skin treatment to help reverse erosion of elasticity and firmness caused by advanced glycation end products. One main cause of visible aging is glycation, which occurs when excess glucose molecules bind to collagen and elastin fibers and prompt the formation of advanced glycation end-products (A.G.E.s) that lead to severe skin wrinkling. A.G.E. Interrupter is a unique treatment formulated with 4% blueberry extract, 30% Proxylane™ and 0.2% phytosphingosine to help prevent the glycation process and correct severe signs of aging in mature skin. Blueberry extract slows down the process of advanced glycation end-product (A.G.E.) formation, preventing collagen and elastin fibers from becoming rigid. Proxylane? stimulates GAG synthesis, restoring water and nutrients to the dermal-epidermal junction. Phytosphingosine helps protect the skin?s barrier to alleviate discomfort associated with dry, aging skin. This product is a restorative treatment for damaged or aging lips. This potent treatment helps prevent signs of premature aging while restoring moisture and smoothness to the lip surface. Antioxidant Lip Repair accelerates cell renewal to keep lips soft and supple without irritation and is ideal for Accutane® users. This micro-exfoliating cleansing gel is ideal for skin prone to blemishes and aging. It contains a powerful trio of exfoliating acirds plus non-drying cleansing agents to remove impurities and excess oils. This daily cleanser targets blemishes and photoaging (fine lines, wrinkles, hyperpigmentation or uneven skin tone) while preparing the skin for Blemish & Age Solution and Blemish & Age Defense. Ideal for combination or oily skin. Also beneficial to use prior to clinical peels. This product contains salicylic acid acne treatment for aging skin prone to breakouts. A targeted, oil-free approach to treat adult acne and signs of aging. This first-to-market acid blend combines 2% dioic acid with an optimal alpha- and beta-hydroxy acid formulation designed to prevent the formation of acne, minimize blemishes, decongest clogged pores and reduce the appearance of fine lines and wrinkles. Blemish & Age Defense reduces excess sebum production, reduces acne-causing P. acnes bacteria, reduces blotchiness, blemishes, and evens skin tone. 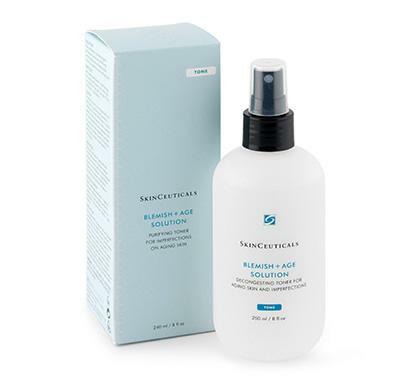 This micro-exfoliating toning solution was created for skin prone to blemishes and aging. A perfect partnet to Blemish & Age Cleansing Gel and Blemish & Age Defnse, Blemish & Age Solution is an ideal combination of acids to remove surface cells, decongest pores and resurface the skin. Ideal for combination or oily skin or for use prior to clinical peels. This combination antioxidant treatment contains 15% L-ascorbic acid, 1% alpha tocopherol, and 0.5% ferulic acid. C E Ferulic® is a revolutionary antioxidant combination that delivers advanced protection against photoaging by neutralizing free radicals, boosting collagen synthesis, and providing unmatched antioxidant protection. More protection means more youthful looking skin and better defense against environmental aging. This product trovides advanced environmental protection against UVA, UVB and infrared radiation A. It also stimulates collagen synthesis to improve signs of aging, increases firmness of the skin and replenishes lipids to reduce wrinkles. Once absorbed, this serum can?t be washed or rubbed off. It remains effective for a minimum of 72 hours, making it an excellent addition to sunscreen. 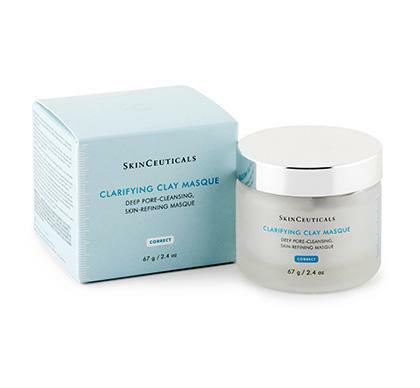 The Clarifying Clay Masque is a deep pore-cleansing, skin-refining masque. This non-drying masque combines kaolin and bentonite, the highest quality earth clays; botanicals and minerals to help heal and calm the skin; and a 5% hydroxy acid blend to gently exfoliate. The 5% hydroxy acid blend gently exfoliates dead skin cells. The kaolin and bentonite, decongest pores, lift impurities, and help remove excess oils. Aloe provides anti-inflammatory properties and chamomile calms and soothes the skin. This lightweight pore-minimizing moisturizer is ideal for normal or oily skin. This product hydrates, nourishes, and helps reduce the appearance of pore size with an exclusive combination of natural extracts. Containing botanical extracts to help reduce pore size, restore and maintain moisture, heal and protect the skin, leaving a smooth, non-greasy finish. This rich, restorative moisturizer is ideal for normal or dry skin. Formulated with an exclusive selection of natural extracts and oils, this rich and restorative moisturizer is perfect for use on dry or sensitive skin. Emollience absorbs evenly and quickly and is ideal for high altitudes and cold or dry climates. Epidermal Repair is a therapeutic treatment specifically formulated to help repair compromised skin by facilitating the rapid restoration of its barrier function. This gentle treatment helps relieve and rehabilitate sensitive skin while greatly diminishing redness and inflammation. Ideal for use after dermatological procedures including light to medium chemical peels, laser resurfacing, and IPL. This product als helps wound repair by stimulating tissue granulation, collagen deposition, and accelerated cell renewal. This pore-refining toner is formulated for all skin types. This alcohol-free toner helps balance, refresh, and restore the skin?s protective pH mantle while removing residue. Hydroxy acids gently exfoliate dead skin cells. This product has anti-bacterial, anti-fungal and anti-inflammatory properties. Botanical extracts such as witch hazel, rosemary, aloe and chamomile soften, soothe and tone the skin. Fragrance and oil-free. A synergistic combination of highly effective, yet gentle phytochemicals rehabilitates mature, aging skin around the delicate eye area. This rich, corrective emollient treatment is specifically formulated to counter the three prime signs of aging - moisture loss, collagen breakdown, and free radical damage. Supports replacement of lipids in dry skin to improve the appearance of the delicate skin around the eyes. Helps relieve the appearance of under-eye puffiness and calm irritated skin. Formulated to combat collagen breakdown and moisture loss in aging skin, this light, rehabilitative cream restores firmness, replenishes lost moisture, and nourishes depleted skin. Helps correct age-related damage. Supports collagen and hyaluronate production to firm skin. Supports replacement of lipids in dry skin. Protects against free radical damage. Formulated for dry, mature skin. This mild cream cleanser is formulated for dry, sensitive or traumatized skin. Gentle Cleanser removes excess impurities and oil without drying the skin. Gentle enough to be used several times a day, this cleanser conditions, soothes, and calms the skin. Contains non-irritating emollients and skin conditioning ingredients. Ideal after in-office skin rejuvenating procedures. This moisture-enhancing gel is enriched with vitamin B5 - known to help with tissue repair and replenish nutrients. Hydrating B5 Gel replenishes nutrients the skin needs to feel smooth and appear younger. This moisture-enhancing gel contains hyaluronic acid, the body's natural hydrator, to bind moisture to the skin. This product maximizes the benefits of a daily moisturizer and is recommended for use with vitamin C treatments. Ideal for all skin types. Designed for congested and rough skin, this mild exfoliating gel combines natural microbeads with gentle cleansing and hydrating agents to thoroughly cleanse pores and promote healthy cell renewal without damaging or drying skin. Gently exfoliates and polishes away dead skin cells. Helps to soften and smooth skin. Ideal for all skin types (except sensitive skin), specifically for combination and oily skin. This broad-range antioxidant treatment combines 2% phloretin, 10% L-ascorbic acid, and 0.5% ferulic acid. It provides advanced environmental protection to defend skin against the reactive molecules (including free radicals) that are known to cause cellular damage. In addition to its superior antioxidant capabilities, it has been proven to correct existing damage from the inside out. Provides advanced environmental protection against UVA and UVB radiation. Stimulates collagen synthesis to improve signs of aging. Diminishes hyperpigmentation and accelerates cellular renewal to retexture skin. Once absorbed, this serum can't be washed or rubbed off. It remains effective for a minimum of 72 hours, making it an excellent addition to sunscreen. Optimal for sensitive or problematic skin, this light oil-free serum contains botanical extracts with anti-inflammatory and antiseptic properties to help soothe and calm irritated skin. This product is an excellent oil-free hydrator for acneic skin. Contains anti-inflammatory cucumber and anti-bacterial thyme to soothe and calm irritated skin. Helps prepare skin for rejuvenating procedures and reduces post-treatment redness. Plant glycosides help minimize discoloration. This daily high potency brightening treatment contains 1% Hydroxyphenoxy Propionic Acid and 0.5% Ellagic Acid. Advanced Skin Discoloration Corrector lightens and reduces existing hyperpigmentation (brown spots, freckles, dark patches and blotchiness), improves overall skin tone for a brighter, more radiant apperance, and protects skin from future discoloration without the potentially harmful side-effects of harsh bleaching agents. This product combats environmental triggers of redness to alleviate irritation and discomfort. Formulated with patent-pending NeuroMed Complex, Redness Neutralizer prevents and corrects redness associated with rosacea by combating environmental triggers and interrupting the inflammation cascade while protecting the skin?s barrier. Minimizes redness flare-ups by controlling hyper-reactivity to environmental triggers. Cools skin temperature, ideal for rosacea as well as sensitive skin types and conditions. Down-regulates pro-inflammatory mediators to reduce inflammation that leads to redness and flushing. Clinically proven to improve skin smoothness and radiance. Paraben-Free, Fragrance-Free, Silicone-Free, Dye-Free, Alcohol-Free, and Non-Comedogenic. This bi-functional revolutionary resurfacing and replenishing serum surpasses the results of a daily 20% glycolic acid treatment while simultaneously reinforcing the skin's barrier for healthier, more radiant skin. Normalizes epidermal renewal to create a noticeably smoother, softer surface texture. Stimulates enzymes that help break the bonds that bind dead cells to the surface of the skin, to dramatically diminish surface lines and wrinkles. Speeds skin-cell turnover to improve skin?s radiance, keeping new, healthy skin on the surface. Balances skin moisture levels and reinforces the skin's barrier. This product is a refining night cream with 0.5% pure retinol. Our retinol products help stimulate cell regeneration and build collagen to diminish the appearance of fine lines, wrinkles, uneven tone and age spots from both photo- and intrinsic aging. Retinol 0.5 is recommended as a prerequisite to SkinCeuticals Retinol 1.0. Preserves optimal retinol stability and minimizes irritation commonly associated with the use of retinoids. Ensures maximum amount of retinol reaches the target site. This product is a maximum strength refining night cream with 1.0% pure retinol. Our retinol products help stimulate cell regeneration and build collagen to diminish the appearance of fine lines, wrinkles, uneven tone, and age spots from both photo- and intrinsic aging. Additionally, they help minimize the appearance of pore size while correcting blemishes and blotchiness often associated with problematic skin. Perfect for problematic and photo-damaged skin, Retinol 1.0 should be used for advanced treatment of pre-conditioned skin. Preserves optimal retinol stability and minimizes irritation commonly associated with the use of retinoids. Ensures maximum amount of retinol reaches the target site. Serum 10 combines 10% L-ascorbic acid with ferulic acid to provide antioxidant and anti-aging benefits such as reducing the appearance of fine lines and wrinkles. This products helps restore healthy looking skin by neutralizing free radicals, defending against environmental damage, and helping to prevent accelerated aging by stimulating collagen synthesis. Using Duke-patented vitamin C technology, this serum delivers 10% L-ascorbic acid to the skin. Once absorbed, this serum can't be washed or rubbed off. It remains effective for a minimum of 72 hours, making it an excellent addition to sunscreen. Ideal for sensitive skin types and conditions. This mattifying fluid provides broad UVA/UVB spectrum protection for all skin types (even very sensitive) with 100% physical filters, transparent titanium dioxide and zinc oxide (Z-Cote® *). Enhanced with artemia salina, a plankton extract, this lightweight sunscreen is a weightless fluid that spreads evenly and dries quickly, leaving no residue. Paraben-free, non-comedogenic. *Z-COTE HP-1 is a Registered Trademark of BASF. Ideal for normal, oily, or combination skin, this pore-refining gel cleanser combines an exfoliating hydroxy acid blend with botanical extracts to smooth out rough texture while gently removing impurities, excess oils, and makeup. Contains botanical extracts of chamomile and aloe to help soothe and heal skin. Delivering a new standard in eye care, this ophthalmologist-tested sunscreen defends, enhances, and optimizes the entire eye area, including the eye lid. Formulated specifically for the unique structure of the thinner and more sensitive skin around the eye, Physical Eye UV Defense provides broad spectrum SPF 50 protection without migration or irritation of the eyes. A unifying tint enhances skin tone while ceramides nourish, creating a smooth, optimal canvas for makeup application. This mattifying 100% physical sunscreen is formulated with titanium dioxide and zinc oxide (Z-Cote*) to provide high broad spectrum UV protection. Enhanced with aerated silica technology, it is proven to maintain a matte finish even in hot, humid conditions. Its weightless mousse texture dries to a powder finish, optimizing makeup application, while translucent color spheres provide universal tint for all skin tones and repel oil to minimize sebum appearance. With age and ongoing aggression, skin accumulates excessive free radical damage and loses its efficiency to effectively repair at night. This compounded effect leads to accelerated signs of damage such as loss of radiance, elasticity, and density.This antioxidant night concentrate with a maximized concentration of 1% pure, stable resveratrol, synergistically enhanced with 0.5% baicalin and 1% alpha tocopherol (vitamin E) boosts skins own antioxidant defense system to promote its natural nightly repair for improved radiance, elasticity, and density. This Daily Skincare Program provides the essential tools to help achieve healthier skin using retinol, specialized enzymes, and antioxidants to promote cellular function and restore and maintain youthful, healthy-looking skin. This cleanser hydrates and rejuvenates without disrupting the moisture barrier. Using panthenol and allantoin to soothe, repair, and restore skin, it cleans away dead skin cells and supports cellular renewal. Calming agents help prevent inflammation as retinol and other ingredients work more actively overnight to repair and regenerate skin cells to help reduce fine lines and wrinkles. This functional hydrator contains encapsulated retinol, powerful antioxidants and an anti-inflammatory agent to calm, replenish, rejuvenate, and repair the skin moisture barrier. A full 1% concentration of retinol stimulates new cell activity and collagen formation in aged and UV damaged skin faster and more effectively than any other anti-aging treatment. A palette of shimmery hues with complimentary matte shades that can be used to create limitless looks for day and night that flatter all eyes. A compatible duo of high-pigment mineral blush colors to contour and highlight cheeks. Apply individually or blend together for a radiant glo. GloProfessional Makeup Blush- Bare, Begonia, Bellini, Hibiscus, Innocent, Nector, Papaya, Paradise, Rosebud, Sandlewood, Sheer Petal, Spice Berry, Sunset, and Sweet. The eyebrow is the picture frame of the eye. To make sure your eye is always perfectly framed, glominerals offers brow powder duo shades to expertly match any brow color. Mix the 2 shades to expertly fill in sparse areas of the brow. The angled blush brush works to enhance contours of the cheekbones and facial structure. While this brush is ideal for blush application, we also recommend the angled blush brush to contour the face. All-over eye shadow base made simple. 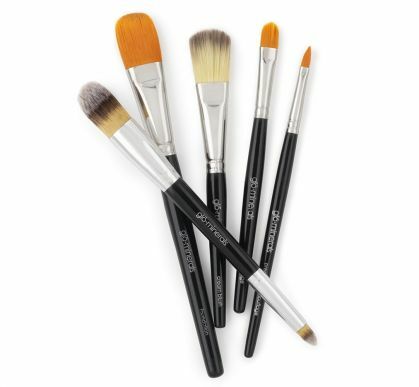 This luxuriously fluffy eye shadow brush deposits pigment and blends effortlessly. Infused with spheres of Marine Collagen Atelocollgen. These spheres work to plump lips by trapping water and swelling, thus providing volume to the skin's structures. For a poutingly plump pucker, apply Lip plumper alone or before your lip color. 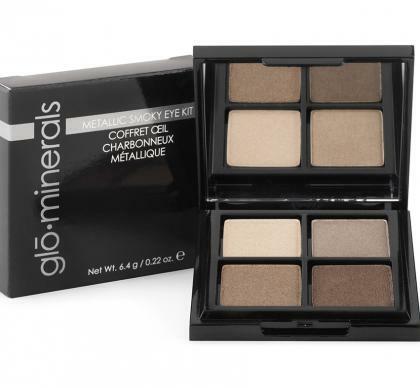 This sheer, easy-to-apply formulation expertly neutralizes and conceals skin discolorations. Select the appropriate shade of camouflage then stipple product onto desired area. 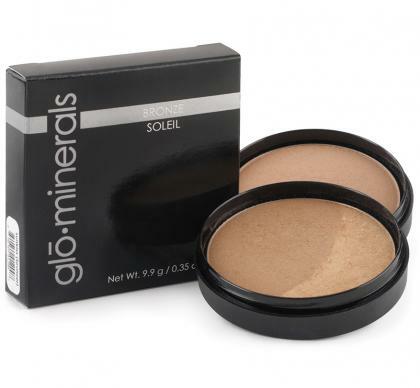 Follow application with glo minerals foundation and color for beautiful, flawless skin. For tips on using color theory to camouflage everything from blemishes to under eye circles, use the enclosed application guide. 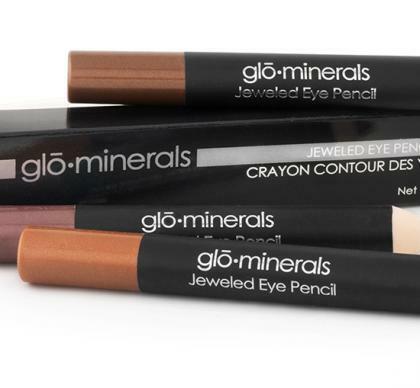 glo minerals Concealer Under Eye offers rich mineral pigments to conceal and clinically advanced treatment ingredients to help improve dark circles and hyperpigmentation. Includes treatment benefits to help brighten and improve dark circles under the eyes. Blend the two concealer shades to perfectly customize to your skin tone. Tranform your lips in one easy step! Nourishing wax microcrystals derived from jojoba seeds slough away dry skin and then melt on contact to deliver soft, smooth and hydrated lips. 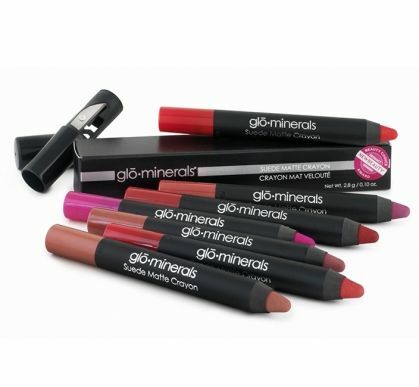 Moisturizing lipstick that provides vibrant, long-lasting color and remarkable wearability. Our Lipstick is fortified with the exclusive glominerals antioxidant blend of Vitamins A, C, E and Green Tea Extract. Glides on with pinpoint precision and dries quickly--lasts all day! Plum, black and brown color pigments can go from a delicate enhancement to an intense bold line. This loose mineral foundation formulation is beautifully pigmented and luminescent It offers medium to full coverage with a dewy finish. It is well-suited for sensitized skin. As with all of our products, Loose Base is talc-free, non-comedogenic and fortified with our exclusive antioxidant blend. Harness the light-refracting power of diamonds to bend light for a soft, ageless complexion with glo minerals Luxe Liquid Foundation. Luxe Liquid Foundation is formulated with light-diffusing diamond powder and specialized moisturizing agents to deliver a flawless, youthful complexion. Protects lips with full spectrum SPF 15 while nurturing botanicals of hemp seed oil, meadowfoam and mango seed butter soothe and heal. This truly translucent skin perfecting mineral powder absorbs excess oil to provide a matte finish. To eliminate shine year-round or simply control skin during the hot summer months, Perfecting Powder can be used as often as necessary over your foundation to give a shine-free finish. 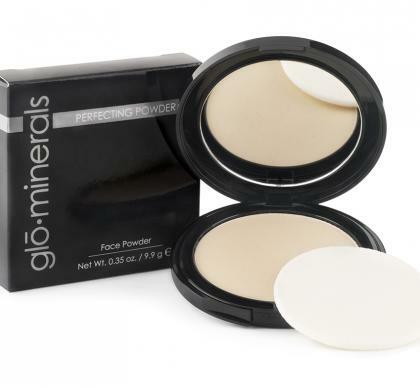 As with all glo minerals products Perfecting Powder is talc-free, non-comedogenic and fortified with our exclusive antioxidant blend. Use Face Primer before foundation for a flawless application. 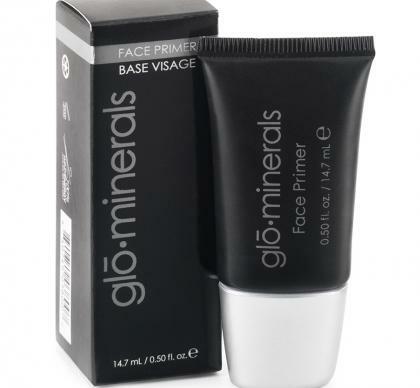 Face Primer creates an even, ideal canvas for foundation by filling in fine lines and large pores so that foundation goes on looking percelain smooth. Precision, drama, definition and staying power- create the perfect line and master the timeless cat eye withthe smooth application and convenience of a felt tip pen. Add a hint of radiant light with glominerals highlighter. Apply this pink luminizer anywhere you want a subtle, natural glo that can instantly brighten your complexion. The perfect finishing touch! Silky-soft, weightless-finish pencils combine sophistication and luxury with a gliding formula, to create any look with ease from desk to date night. Jeweled Eye Pencils deliver rich, buildable pigment at just the flick of the wrist - for eyes no one can resist. 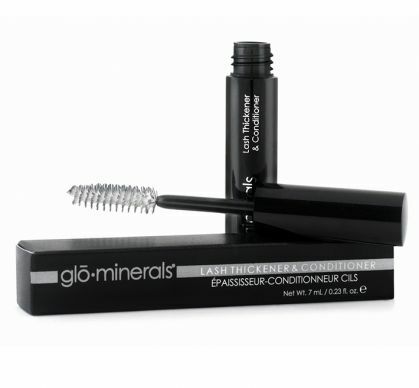 Containing lash conditioners and film-forming polymers, this mascara is formulated for optimum performance. Lash Boosting Mascara does all the eye-wonders in one formula - volumizing, thickening, lengthening, strengthening and conditioning. Look for long-lasting, bold, lush lashes you'll love. This long lasting, wax-based formula glides on skin and won�t budge or smudge after application for over ten hours. Fills in brows with the precision and detail of fine, hair-like strokes for a perfectly natural look. Protect skin beautifully with Protecting Powder SPF 30. This dust-on broad-spectrum SPF powder defends against the sun's damaging rays and gives skin a complexion perfecting layer of color. 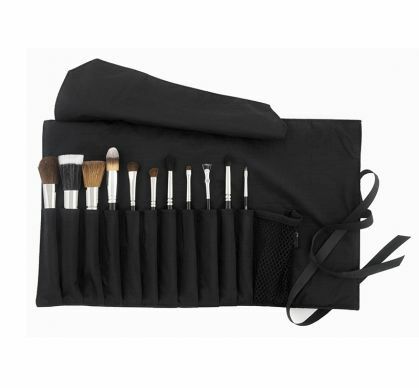 The easy-to-carry brush is perfect for beach bags or purses when you need instant sun protection. Choose from two shades, translucent and bronze, each formulated in a loose powder to provide full to medium coverage with a dewy finish. Soothing, oil-absorbing liquid mineral makeup for buildable coverage with a matte finish. As with all of our products, Protective Liquid Foundation - Matte II is talc-free, non-comedogenic and fortified with our exclusive antioxidant blend. A luxurious loose powder to set Luxe Liquid Foundation and blur fine lines and imperfections for a luminous soft focus effect on the skin. Provides weightless coverage with a sheer, silky smooth finish to leave skin looking flawless. Formulated with our signature blend of antioxidants, Sheer Tint Base delicately camouflages flaws and nourishes and protects skin with sheer coverage for a healthy glo. A sheer, light-reflecting formula that visually smooths the appearance of fine lines and illuminates skin tone creating a healthy, luminous glow. Apply under foundation. Beautiful for all skin tones. Four beautiful colors to swirl together for a captivating glo or to use individually to illuminate key features. This fabulous multitasker can be a bronzer, highlighter or eye shadow quad all in one! Matte redefined. Saturated, long-wear color provides intense payoff with a velvety-smooth finish. Our matte lip crayon is enriched with antioxidant Vitamins C and E as well as conditioning Mango Oil and Shea Butter for nourishing protection. 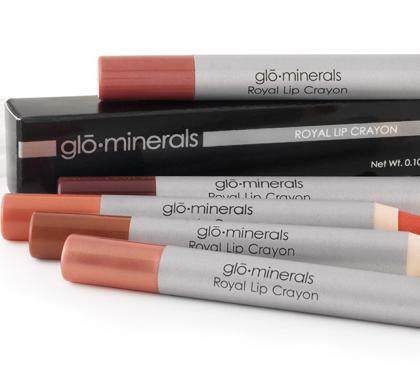 This crayon-inspired chunky lip pencil with built-in sharpener delivers precision and convenience in one. This silky, oil free, tinted primer glides on to instantly even skin tone, mask imperfections and provide all day coverage. Wear alone for sheer radiance or prep foundation for a flawless complexion. Get the perfect applicator for Luxe Foundation. Achieve smooth, buildable coverage with a satin finish with our leading liquid mineral foundation. As with all of our products, Protective Liquid Foundation - Satin II is talc-free, non-comedogenic and fortified with our exclusive antioxidant blend. Affordable, doctor recommended, non-surgical option to improving the appearance of your scars for all skin types and color. RejuvaSil® Liquid Silicone Scar Gel 30 ml for Surgical Scars and Burns. RejuvaSil® Silicone Scar Gel contains Liquid Silicone plus Vitamin C, Emu Oil and Squalane to improve the appearance of scars. Most silicone gels only contain silicone and remain sticky on your skin. Our unique formulating process allows RejuvaSil® Scar Gel to dry quickly and does not remain sticky. RejuvaSil® Silicone Scar Gel is an alternative to Scar Fx® Silicone Sheeting. Scar Fx® Silicone Scar Sheet with a tacky side to adhere to your scar. Scar Fx® Silicone Scar Therapy is a medical product that can help improve the appearance your new scars as well as being an effective scar treatment on older scars. Scar FX® Scar Therapy is effective on your most severe scars which include Hypertrophic and Keloid scars. Also, it works well on scars caused by burns or surgical scars regardless of the age of the scar. Scar Fx® Scar Therapy is a non-surgical, low cost approach to making your scar tissue soft and smooth. While Scar Fx® Scar Therapy neutralizes the scar’s color, it works to flatten raised scars. It is easy to use and has no reported side effects. Scar Fx® Scar Therapy is a soft, pliable, silicone formulated sheet that contours easily to any part of your body. Scar Heal Silicone Sheeting- 1.5"x3"
Scar Fx® Silicone Sheet with a tacky side to adhere to your scar. Silicone Scar Therapy is a medical product that can help improve the appearance your new scars as well as being an effective scar treatment on older scars. Scar FX® Silicone Scar Therapy is effective on your most severe scars which include Hypertrophic and Keloid scars. Also, it works well on scars caused by burns or surgical scars regardless of the age of the scar. Hand selected products for you. 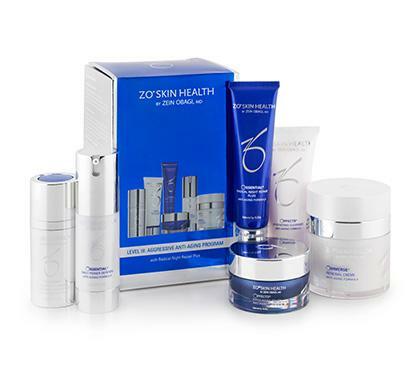 This is a comprehensive 24 Hour Regimen to best protect and repair your skin from the environments free radicals. This package is recommended to all of our patients that do a series of peels for optimal results and . All cosmetic patients received the best products to help with healing and scarring from their surgeries. This package is included with your Laser Resurfacing Treatment when booked with Dr. Dawes.